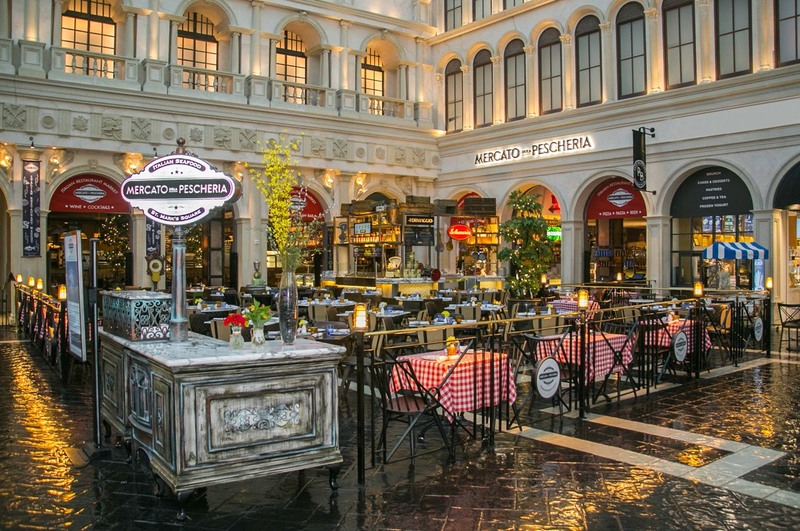 Welcome to Mercato Della Pescheria, an authentic market-style Italian Restaurant in Las Vegas, NV. The freshest seafood and Italian cuisine in Las Vegas is prepared for you in our open kitchen. Enjoy an authentic Italian drink in our comfortable lounge, while our chef prepares the freshest fish from the crudo, the choicest meats from our own macelleria. We promise you an extraordinary Italian feast, cooked on coal-fired stoves. We season with freshest, all-natural herbs and authentic Italian ingredients. Savor fresh homemade pastas in our gorgeous indoor dining room or enjoy an authentic Italian pizza, served hot from our wood-fired oven on the patio overlooking St. Mark’s Square. For a truly authentic Italian Restaurant experience finish your meal with a gondola ride at the Grand Canal Shoppes, in the center of St. Mark’s Square at the Venetian & Pallazzo Hotel & Casino, near the Sands Expo & Convention Center in Las Vegas, NV.